We drive through national highways and I should say national highways lose the charm of traveling and bored due to emptiness. What I say as emptiness is because, it seems same everywhere u see and untouched towns and cities that lack interest and without trees it makes harder the travel on day time without switch on to A/C. I acknowledge the development of NH’s make easy and smooth driving for those travels often and who’re in time to reach, and accident free, but for me who loves traveling, NH carries nothing interesting for about sitting simple for hours. I also not forget to appreciate the NH’s authorities for bringing down heaven to earth by constructing these huge platforms for vehicles and wonder elsewhere looking at its building. Waiting at the railway gate for minutes to pass the train with enthusiastic and in meantime tasting something from the window side vendors, who rushes in seeing our vehicles being stopped are one or few things that irritates then is out of sight, and we get nothing much in favor to see and know something from today’s NH. The roads are wider, clean and narrow; and the plants planted on the center corridors help reducing the head aches and dark eyesight due to the flashing against vehicles. Those are days we get to sense the changing atmosphere and nature while traveling, and within closed window and not much to observe, the traveling set to a mood of cool darkness. Compared to NHs, I go with SHs (State highways) even it was single lane and highly threaten and little more shadows; and these NH helps people who’re destination freak and who’re fates to live inside, thus every move has something different. 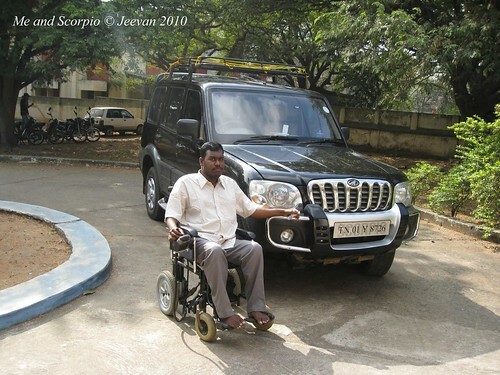 My favorite Black Scorpio, taken in pollachi guest house. Even I chose to be unfavorable about the late NHs; I understand the need of best NHs and connecting cities and towns easily and welcome people for a pleasant ride I was traveling to pollachi last month and most of the roads that lead were NHs and the road from Chennai till Ulundurpet was very smooth and fine, and though we had to cutting Salem, we kept back the velocity and somewhere on this stretch I could see black smokes arriving through the ventilation towers of sugar factories on an active Monday morning. There are toll gates that come as huge speed barkers at every certain km to collect money and many people blame these gates in impatience as if they’re bill gates having hat full of work. People told me to tie a political flag in front of the car; so that these gates will open freely, but I told clearly that I won’t climb the car if someone does like that. I have wondered like everyone, looking back the pristine roads and streets of foreign countries and when we experience something similar we have to be supportive and not make deceive. I feel it’s worth paying attention to these toll gates for a peace, pleasant, safe and fast journey in time and distance. 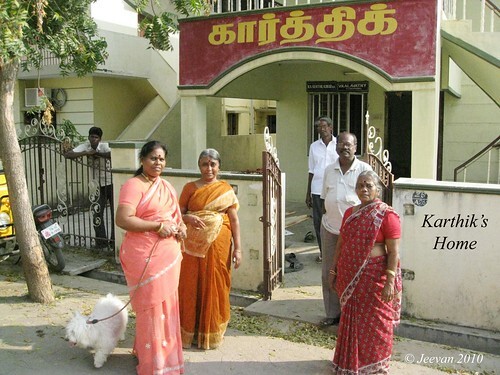 Karthik's home in Salem. There karthik's mom,my mom -holding maya, grandma and dad. I think back there’s nothing much interesting to describe about traveling in NHs and the road lead to Salem was under construction and there are many ups and downs shifting back. 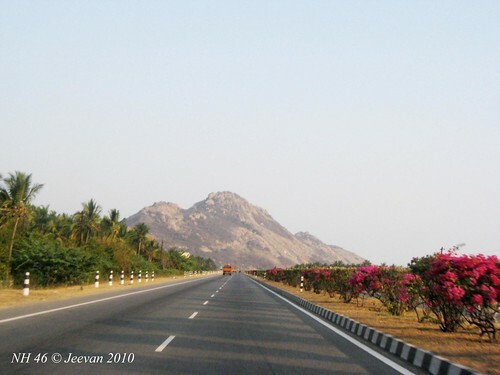 There’re no memories about visiting this city more than a decade ago, the hills surrounded Salem is quite busy even at heavily strikes noon and we passed a street alike T.Nagar in Chennai. There’s much difference in food compared to Salem and Chennai and other places, as we pay more and get less in Chennai, thus we pay less and get much as food. There was a warm smile welcome us into their home in Salem against the sunshine and it was karthik’s mom whom waiting for us at her gateway and we spent sometime and left with a cup of cool drinks. 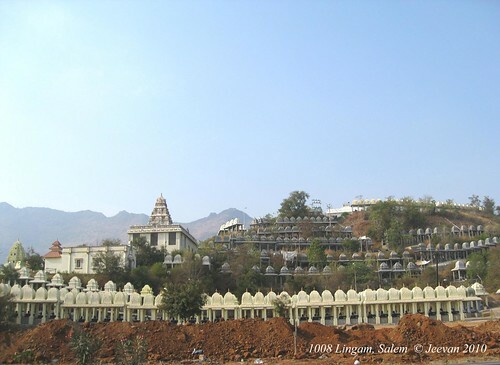 It was again the NH’s and on the way came the 1008 lingam temple, where it’s under construction on a hillock near Kanjamalai and temple is belong to Vinayaka mission, a private education institute. The temple was wonderful to see from the road with hills at background. 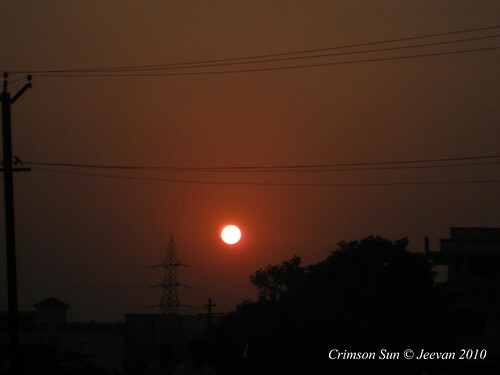 It was a coincident to face the sunset again this time passing through tirupur and it was another crimson sun. 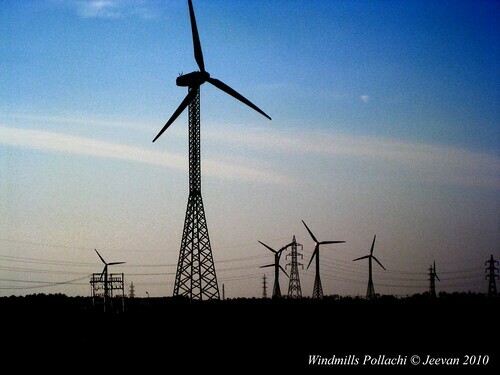 It was turning down to sunshine and dimness emerges as we’re heading towards pollachi and it was stars like spread across the landscape, where the lights of windmills glow to silent movement. At last reach the pollachi gust house and hand felt asleep as soon spreading across the limbs after dinner. Well we continue in another post. Red Hills and little something. It’s been a while I sense something true happiness and smile; and even then it wasn’t unusual, it sense me something wonderful as no one lately conveyed me love and gratitude this open mind. He’s someone very kind and innocent and a close friend of my dad and I have been reminding him to visit sometime and thus we suddenly decided and went to his home on Sunday in Red Hills. He’s very glad about receiving me and I just felt how sustain he was truly expressing his desire and happiness, and it was such obvious and touching me. Unlike before, generally I don’t care about others in case my existence gives happiness to someone in dear and who could brake the barriers when there’s a concern and desire for me, but I do expect some respect and I can’t go ahead if there are others who feels unease and hesitate. Even I understand, the attitudes change from a person to another and though directly or indirectly, when facing a situation that seems someone neglect us in all cause present distress. Except him and his missus, others aren’t familiar with me, but there’s noting to feel bad about before the couple’s gratitude and gratification. We had our lunch there and sight their newly constructing home later over conversion and went to the Red Hill’s Lake while returning in evening. There was something disturbing me there and it was nothing the bees and after a beetle entered by ear lately, I’m so frighten about these insects. First there was only one flying across their home and never turned away, and later watching it carefully I guessed it was not the one, but there are many bees on there way to their home through a open window and buzzing across my face while enter the room and I waited sometime for there turn, but they never return. I hope there was something under construction of bees inside there home and wished it never disturbed there peace. It was scorching Sunday and roadside tender water also reflects the heat in producing gentle salt water and wanted to think the tender coconut also get sweat in sunshine! Sunday afternoons are my favorite and due to gentle wind and empty state and sound to slumber, the moment would sense bliss in silence. There was nothing different where I was, the mind spontaneously touches those sense and throw back. Climbing and moving along the bank of Red Hill Lake, views the entire reservoir in its full capacity, leaving alone a narrow line at distance and the gleams of sun set, which was something awesome across the lake producing golden glisten. 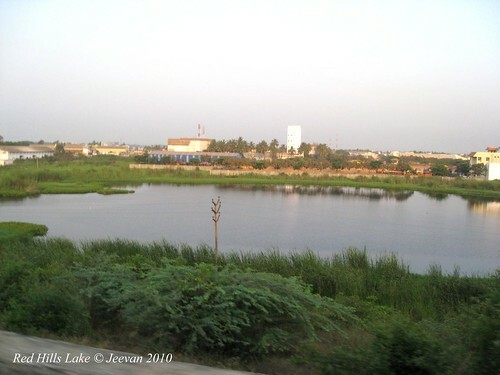 It seems like a best place for the locals to go for a walk in morning and evening on the lake bank, keeping beneath the fast moving world and clam water bodies. 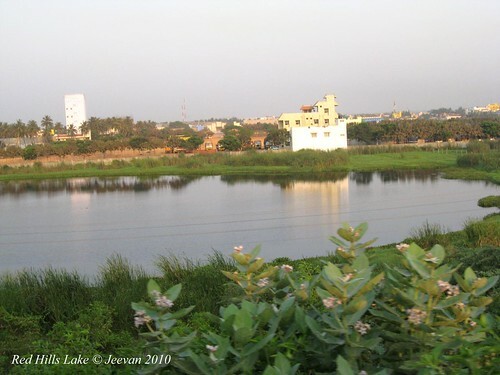 The lake is an important source of drinking water to Chennai, connected by couple of huge and small reservoirs in Thiruvallur District. 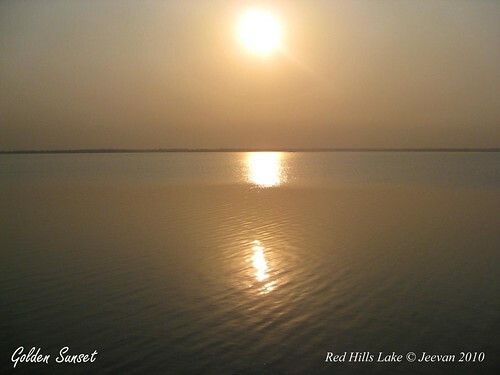 The lake was still called as Pozhal Eari in Tamil and it continues to quench thirst of chennaities since 1868. 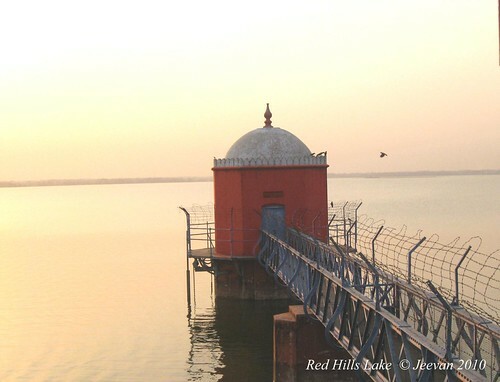 The lake continues to hold its full capacity lately, receiving water from Kandaleru dam in Andhra Pradesh through Poondi reservoir apart storing rain water. One part of the lake bank has a better road to move on vehicles, viewing the lake and has sitting platform along the road to spent sometime in evening. The water level watch tower is a famed portion through media and stance as a picturesque with water background. On way back we saw the crimson sun in its whole circle, playing hide and seek between buildings. It wonders to see even on Sundays there’s heavy traffic in city and its suburb, and it sense injurious these days traveling in and around the city. Man I’m truly worrying about my environment whenever laving out of home and do wonder where our world is heading for and what do us and government to reduce the vehicle traffic and pollution. Ho! The whole world is rotating, and now includes my head. 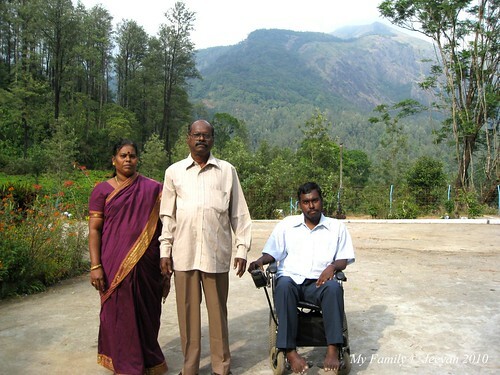 I was watching a program ‘what happens?’ on television and the day’s topic was about a gigantic join family in Tamil Nadu. It was amazing to see about 175 persons living in a family, without any obstacle and misconception. Being a traditional join family, it’s astonishing to see there faith and hope to lead the family as it is forever. It is impossible to think about joint families in today’s modern times and there’re many families only willing to separate as nuclear family and none is on course to merge the dispersed families. I’m someone always wish to survive within a join family, as I have experienced it back by sharing with my uncle’s family, I somehow know its advantage, potential and togetherness about living as a joint family. Many relationships have turned into much selfish these days to distinguish everything to mind and its very little wonder to see how people have changed in attitude. I always remain to never change in attitude and not even willing to change even I feel different in mind and action, but people change, so we are likely to change, but still I hope in relationship. Changing to much immobile, it’s getting harder for my parents to take care of me and it’s impossible to avoid the thoughts of relationships that refuse to come on desire and prevent assisting. It’s truly hurting to see many relationships are at enquiry level. I don’t know what’s matter in saying we’re relatives, when the relationship is just in query ‘how r u’? I know it’s a manner across world, but what makes deplore is when it stops at entry level. What is relation and what makes relationship is obvious, but the level of obtain is still debate. When relatives come closer is, when we’re in happiness and death, and when we’re in suffering and in need of aid, everyone stance in distance. I wonder why relatives don’t come in distress and come on there way without invitations to share our happiness and wealth. I too wonder sometime what people might think or not about me in meantime meeting each others. I always wish to share with relatives, who come and make desire words in seeking each others and pass like a passing clouds. I’m so innocent you know, whatever people say I hope in desire and expect it to be true. But the fact is still I believe in those people and even I come to a mind to accept and share with wiser, and when we face a distress or hardship only anger comes on them. Is happiness alone life? Money is a magic tool and could disappear anytime or moment. So we can’t be happy alone with money, and it’s a matter nothing matter when it comes to relationship, because money doesn’t related people as relatives and it’s our elders and practicing kinship. And why I say this is because we’re most of the time surrounded by relatives often and neighbors and friends stay in distance; and we can’t expect them more after certain limit, but I often think and wish this distance should be reduced or break apart to showcase the world, that we’re relatives no matter what’s background. When we die nothing much loses or bothers anyone except our family, very close relationships and trusties, but we can’t live as it is nothing bothers life after death. Relationships aren’t crunchy and munch we chew in time pass and while surrounded by boredom and something in demand. Life is not alone delivery and death that we exercise lonely, but relationship is a practice that comes along our life, through ups and downs, happiness and distress, success and lose, depression and love… but how many relationships follow this formula, life? Tuesday was dad’s birthday and we went out for dinner, collecting food stuff from hot point and headed to beach. Wind was blowing well and sea gleaming with ships; it was pleasant moment we four of us shared the night together after long time. The sea side wasn’t much vast empty and few street lights were out of focus, and the waves reflect clearly, and stars blinked brightly and a flight was passing across. We were till 10.Oclock at beach and dad been forgetting his birthday and since remind by noon, he wishes at least to take us out for dinner. Brother being a vegan, we can’t visit KFC or Food village in ECR what was in our mind then. Unlike the treat in Hot Chips, ECR with favor and nothing more savor on the arrival of new Scorpio last month, it was sharing; love and nature embrace us more now. Moreover the roadside vendor or hot points round table, nothing deserves the flavor of closed woodland’s drive-in near Anna flyover. The evergreen trees and chirping birds and spacious car parking could never be replaced by any modern restaurant or drive-in or fast food. Thinking about those days, whether it was hot and crisp dosai or puffed poori, still the blowing wind has the essence of woodland and the aroma comes over the air. I don’t know which one to take and leave, there might be some ups and downs, but it was a lovely ride across the sky. VTV (Vinnai Thaandi Varuvaayaa) is a very beautiful poem written by Gowtham, and Simbu does a very decent proposal whereas Trisha comes as an angle with cute smile and freak in sari. The highlight of the movie is songs and pleasant picturesque. The love come romance between the lead was soothing and does some magic in imagination. Should appreciate the background scoring, that pass like a breeze in an undisturbed manner, and just not being vocal, I wonder sometime does someone parked next playing there audio of the same movie songs. Leaving mom at home, me and dad watched the movie in drive-in. It was against feeling, wishing for songs to keep flowing more than the sequence, and so as the songs influence the movie. I loved the quietness of the movie, and the simple action and screenplay, describes a familiar story in an unusual manner. There’s a small distraction on simbu’s face, at some places it clearly says the huge makeup and obviously he’s very smart in his original tone. I then thought, why dint I continue to be a simbu fan? There’re mild moments to laughter and to wonder how come a busy cameraman simply follows Simbu in seeking Trisha across the Alappuzha. The white church on bank ashore and the houseboats and river are evergreen blue wonder. The gentle kiss and intense love, embrace the audience to fall in love and like the line says, love is not we go in seek, and don’t leave love that come across u. 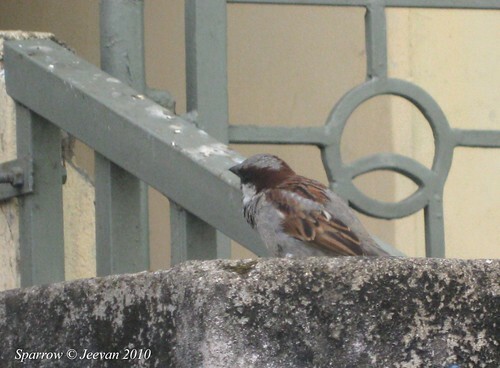 Leaving back memories, the house bird sparrows flew far away and become a rare species in cities. There are days as child trying to catch the sparrows that often visit our balconies and sometimes they built there hay nest in space within pillars and sewage pipes. It’s so nice seeing those small sparrows, sitting in a line on the cable wires that pass across the streets and pierce to feed grain left over the balcony. Today I see sparrows that are two times larges than those similar ones in light brown and grayish color with tiny beaks. There sweet twitters are something lost reflecting in ears that I can’t recall back in memories. Turn over of large trees and green space into skyscrapers and concrete floors, and lose of time in human to feed grains, the birds drew away from city. Sparrows are some species survive along human habitation and what all affect us reflects in them and thus the change in lifestyle and passion disturbed there dwelling. Even in late 90s sparrows were spread across in city independently and it was very short in time and period they went invisible almost. They always pick there place for nesting is inside or at the entrance of homes, storehouses and elsewhere people residing. In villages, people tie a bunch of paddy at there home entrance to treat the little birds the grains and to help nesting. 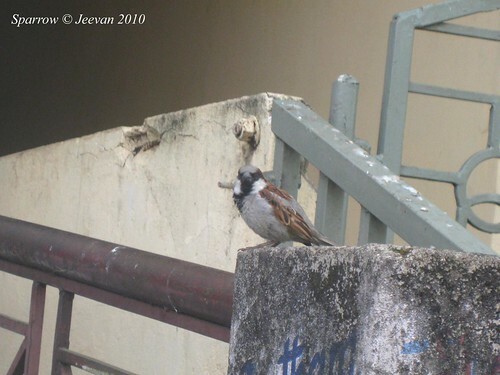 I find some sparrows in valparai surviving along the people dwelling and a sparrow had nested above the shutter of a musical store in a bustle road, where they wander freely and friendly with people at stretching hands end. I wished then I had few of them around my place. 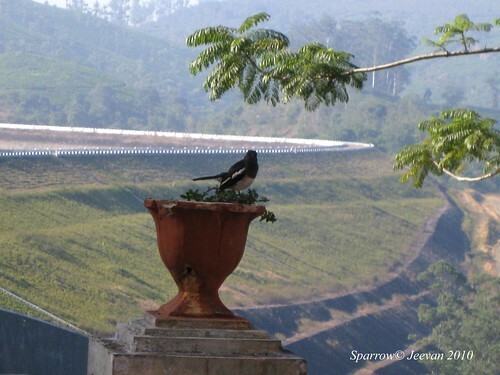 Then one morning, I saw a lonely sparrow sitting on a flower pot in the front yard of Solaiyar house and later when I check the capture, the background came in as a surprise with the curved lane of the Sholayar dam. 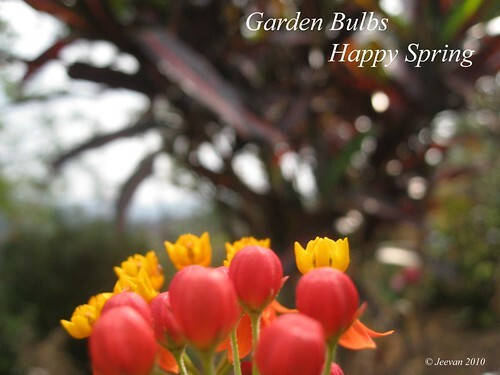 These birds are small, and shares very small space in our neighbor and thinking about them is nostalgia. ஒரு சிறு வேலை என்றால் வேறாளை பார் என்னும். அறிவு வளர்ச்சியில் அறிந்து கொள்ளாமல் போனதால். இறந்த பின் வாடுவதும் உறவாடுவதும் ஏனோ? இறந்த பின் வரும் பண்பு மட்டும் ஏனோ? இறந்த பின் வரும் கண்ணிர் மட்டும் ஏனோ? what does in fading and practicing relationship after death? what does the character that comes after death? what does the tears that come after death? I wonder it’s an ad to promote Slice or Katrina Kaif? I have been watching this ad for sometime lately, and the ad doesn’t give much importance to slice than kaif nor I forget to check out something except kaif. The always pretty woman is such sizzling in this AD and dazzling in red gown, her expressions and movements are simple awesome and sensuous. Anyone would fall in love and romance at the end of this ad, and nothing comes into the frame while seeing kaif.